Seven Sporting Lisbon players have terminated their own contracts in response to an attack by fans, the Portuguese Players’ Union has said. 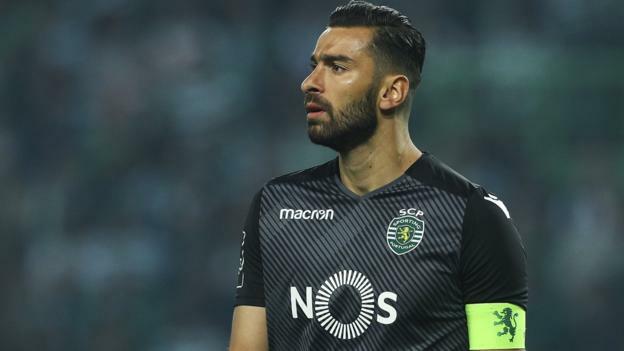 Four members of Portugal’s World Cup squad – Rui Patricio, William Carvalho, Gelson Martins, and Bruno Fernandes – have joined Ruben Ribeiro, Bas Dost and Daniel Podence in leaving. The players wrote to the club, citing “just cause”. It comes after a group of 50 fans attacked players and staff in May. The union added that a court will have to establish the existence of just cause, which means the players would have had a legally sufficient reason for their actions. The attack, in which Dutch forward Dost suffered a head injury, happened at Sporting’s training base, after they missed out on a Champions League place on the final day of the league season and five days before they lost the Portuguese Cup final. In April, president Bruno de Carvalho claimed to have suspended 19 first-team players after a Europa League defeat by Atletico Madrid, although he deleted the post on social media and most of the players featured in their next game.